Alumna Diane Jacobs (Porter College '88) presents for the breath of a poem, an installation in honor of the late Santa Cruz teacher and poet Kathleen Flowers (née Kathleen O'Hearn). 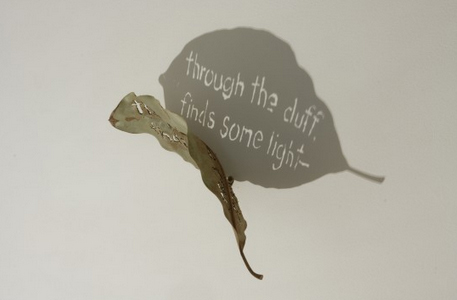 Jacobs has interpreted nine of Flowers' poems through cast shadow in wire text, burned leaves, ceramic letters, sandblasted glass, laser cut paper, and in a video by Ella Anderson. The work is on exhibit in the Sesnon Underground gallery. Free admission. Parking by permit only.